AirTV is a subsidiary of Dish, so that would explain why its pushing both OTA channels and Sling TV a great deal. The box, the AirTV Player, is powered by Android TV, and plays its content at 4K resolution. The OTA channels require an AirTV adapter and OTA antenna, which are both sold separately. As the Player is based on Android TV, the Play Store is accessible, allowing many video streaming apps to be downloaded as well as the pre-loaded options of Netflix, YouTube, and Sling TV. In particular, Netflix can be launched by pressing a button on the Bluetooth remote, which apparently is a unique feature; these are in addition to Sling and Google buttons. All the usual features are of course there too, with dual-band 2.4GHz / 5GHz ac/n/a/b/g connectivity, plus an ethernet port if that's more your thing, and HDMI for connecting to your TV. The remote, which uses Bluetooth Low Energy technology, has voice integration with the AirTV and QuickSet Cloud built-in, allowing it to control any brand of audio or video equipment on the market. The AirTV Player will be available starting at $99.99, or for $129.99 with the optional OTA adapter. In a bonus, AirTV Pro Install is a process whereby an indoor or outdoor antenna will be installed, depending on your location. This is available whether or not you buy an AirTV Player. The service costs $99.99 for an indoor antenna or $149.99 for an outdoor antenna. 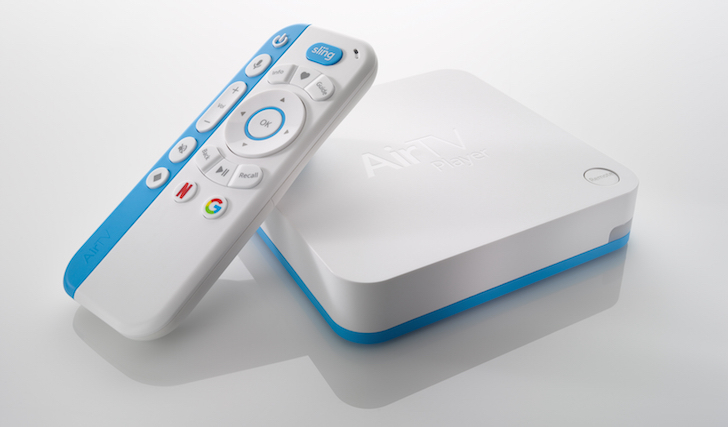 AirTV, a brand dedicated to meeting the growing consumer demand for over-the-air (OTA) products and services, today began offering AirTV Player, a new 4K Android TV-based streaming device, and AirTV Pro Install, a service that offers expertise, installation and setup of OTA antennas. Both are available to consumers nationwide at AirTV.net. When an OTA antenna (sold separately) is connected to the AirTV Player via the USB AirTV Adapter (sold separately), access to local OTA channels is integrated into the Sling TV channel guide. Viewers can watch the OTA channels on the TV connected to the AirTV Player via HDMI and seamlessly switch between OTA channels and Sling TV content without changing TV inputs. Purchase of the AirTV Player includes a $50 Sling TV credit, available to new and existing Sling TV users. A nationwide network of licensed and insured AirTV Pro Install technicians will identify and set up the best available indoor or outdoor antenna solution, based on a customer’s location. The professional installation service is available to all consumers at AirTV.net, with or without the purchase of an AirTV Player.